This Neighborhood article is a stub. You can help cvillepedia by expanding it. Nearly triangular in shape, the northeastern corner is the intersection of the C&O east-west railroad tracks and Ridge Street. From this point, the southeastern border is Ridge and 5th Street Extended until it meets Rock Creek at the neighborhood's southernmost point. Rock Creek is the southwestern boundary, back to the northwestern corner at the C&O tracks, which form the northern boundary. There is a Fifeville Neighborhood Association. 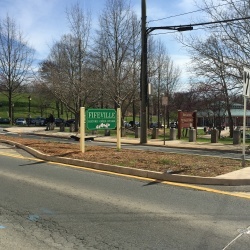 The neighborhood contains Tonsler Park, Forest Hills Park, and Fifeville Park. Fifeville is home to Buford Middle School as well as the Smith Aquatic & Fitness Center. Cherry Avenue is the main corridor, running approximately east-west. The railroad tracks to the north create a significant barrier to pedestrians between the neighborhood and UVa just across these tracks. Parts of the neighborhood are part of the Fifeville-Castle Hill Historic District. ↑ Web. 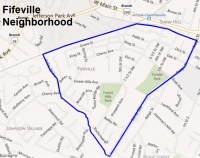 Fifeville neighborhood wants small-area plan for Cherry Avenue, Sean Tubbs, News Article, Charlottesville Tomorrow, June 20, 2016, retrieved January 11, 2017. ↑ Web. Track marks: These lines change lives, Wesley Hottot, The Hook, Better Publications LLC, May 30 2002, retrieved May 2 2011. ↑ Web. Planners tour Cherry Avenue in advance of hotel groundbreaking, Sean Tubbs, News Article, Charlottesville Tomorrow, June 29, 2016, retrieved January 11, 2017. This page was last edited on 9 June 2017, at 11:59.